This exercise book gives an entry in the programming of the EATONs easyE4 control relay. With 30 practicable examples You´ll learn the programming basics including function block diagram (FBD), structured text (ST) and ladder diagram (LD). In the resolution part you´ll find a solution approach to every exercise. The MiniTrainer exercise book is using a long proven didactical structure, it´s the ideal platform for initial and continuing education. 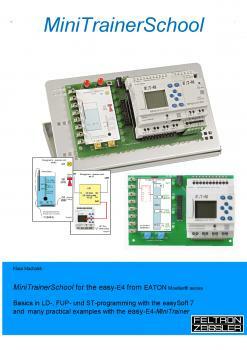 20 learning card for the smaller easyE4-MiniTrainer and the bigger easyE4MiniTrainerXL are included.